We went out again last week, here is another attempt at Jupiter, it is getting better, although you can see the camera pixels on this one but we have two moons too, definite progress. By the way, it’s really easy to see Jupiter’s moons and when we took the picture the great red spot was on the other side. We took more than 15,000 exposures thanks to a comment posted on this blog and it worked, thanks for that! Next I’ll show you the prettiest colour picture I’ve managed to make so far of the Orion Nebula using different filters. It isn’t great but I’ve spent hours trying to do different things and this is the best I’ve come up with in terms of aesthetics so far. So thanks to all for following the blog in 2014 and I hope you have a good holiday! Maybe try a different deep sky object. 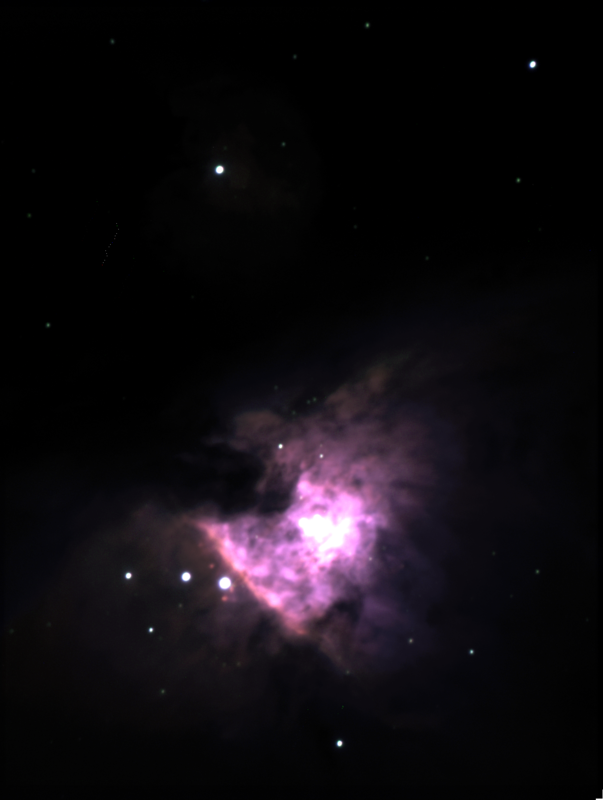 For resolution testing (which looks pretty relevant in the above image of M42) try M13. Can quickly get loads of short exposures with that too.